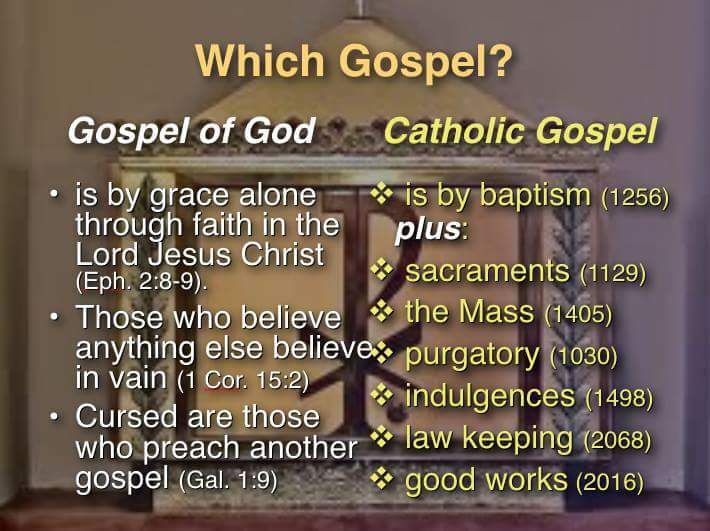 A common question Catholics will have, against Protestant's insistence of Faith alone in Christ alone being enough for salvation, is where in the Bible does it ever say 'faith alone'. The Bible says this simply whenever salvation is addressed, it speaks of faith alone being enough in COMPLETE ABSENCE OF WORKS, of any kind. Mind you all these are QUOTATIONS (word for word) of the Bible NOT INTERPRETATIONS (reword or alterations due to views). Was Abraham saved by faith + works? 23 and the scripture was fulfilled which says, “Abraham BELIEVED God, and it was reckoned to him as righteousness”; and he was called the friend of God. As you can see even in the James 2 verse FAITH comes first and all 3 verses say that Abraham was saved by BELIEVING God. Notice Galatians even saying its MEN OF FAITH, not men of works, who are sons of Abraham (aka: saved). Also unlike what the Church would like you to believe, WORKS DO NOT SAVE. Rather works justifies. justify (verb) -- To demonstrate or prove to be just, right, or valid (true). So therefore the works prove the Faith to be valid or true. Nowhere does it indicate that justified means saved. yet who know that A MAN IS NOT JUTIFIED BY WORKS OF THE LAW BUT THROUGH FAITH in Jesus Christ, even we have believed in Christ Jesus, in order to be justified by faith in Christ, and not by works of the law, because by works of the law shall no one be justified. who are being protected by the power of God THROUGH FAITH FOR A SALVATION ready to be revealed in the last time. Apparently God says BELIEVING IS ENOUGH to be SAVED. The only question is whether Catholics want to be saved or not. When the Bible says Works, does it mean ALL Works? This reminds me of a child insisting that unless the adult specifies each and every type of works, those not named somehow do not count. Is not "good works" still a kind of WORK? Is not "works of the Law" still a kind of WORK? Is not "charity" still a kind of WORK? Is not "works of obedience" still a kind of WORK? Is not "righteous living" still a kind of WORK? Is not "godly works" still a kind of WORK? Notice it is no works, as salvation is NOT OF OUR OWN DOING. This means there is nothing, no activity, that can be done by us to merit nor earn salvation. Therefore to try to mix in works into the equation is ridiculous. In fact there is a reason for this. What is the value of our "good works" to God. 6 We have all become like one who is unclean, and ALL OUR RIGHTEOUS DEEDS ARE LIKE POLLUTED GARMENT. We all fade like a leaf, and our iniquities, like the wind, take us away. So how ridiculous is it of the Catholic Church to insist that Catholics use their best righteousness, which is like dirty rags, to try to earn salvation which requires perfection and holiness? So the question is will you continue trusting the Catholic Church who is clearly Scripturally wrong with your eternal destination? 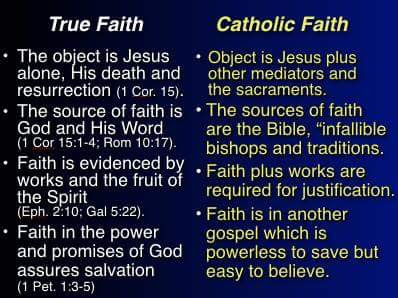 Or will you trust Catholic Scripture that says Faith alone was enough for Abraham to be saved. The REST in God is to CEASE one's EFFORTS in WORKS!! For WE WHO HAVE BELIEVED ENTER THAT REST, as he has said, “As I swore in my wrath, ‘They shall Never enter my rest,’” although his works were finished from the foundation of the world. for WHOEVER ENTERS GOD'S REST ALSO CEASES FROM HIS LABORS as God did from his. Was Jesus sacrifice ENOUGH to cover all sins? Abraham is in Heaven already by FAITH ALONE. Do you want to get into Heaven? You can only get in the same way Abraham did, by BELIEVING on Jesus, since Jesus is God. Best of all the Bible says clearly in Hebrews you can CEASE from your efforts to earn salvation as Jesus work is already accepted by the Father and because man's righteousness is polluted and no good. The Scriptures clearly state that Jesus SINGLE sacrifice on the cross was sufficient for SINS and does not need to be repeated by you nor in the Mass. Won't you do it today and rest in Jesus instead of your works that are no God anyway?